For some people, bad habits are just too hard to break. This is especially true when it comes to Darius McCollum who has a long history of run-ins with the law involving his obsession with all things involving public transportation, especially the MTA. He was the focus of 2 entries on here in 2008. 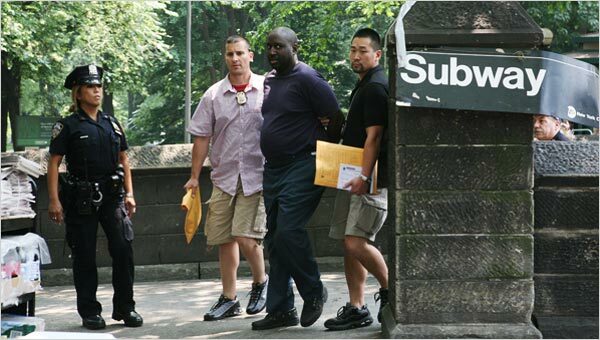 The first was in June as he was busted for impersonating a track worker & entering a restricted area at the 59th St-Columbus Circle station. This was not the end of his run-ins with the law as in October, as he was busted for impersonating a federal agent when he flashed a bogus badge & id to a LIRR conductor after boarding a train at Penn Station. He’s back on the bus – and back under arrest. Darius McCollum, whose mass transit misdeeds include 26 arrests over the last 30 years, was busted driving a stolen bus on the Van Wyck Expressway on Tuesday morning, police said. McCollum, 45, of Harlem, was behind the wheel of the empty Trailways bus when he was stopped near Exit 10 in Queens by the NYPD at about 9:15 a.m., police said. The cops were responding to a call from New York state police about a bus stolen from a maintenance facility in Hoboken, N.J.
A bus dispatcher checking the GPS found the vehicle was off-site and driving in New York City, said Trailways vice president Anne Noonan. Police tracked the bus using its GPS, and McCollum was arrested without incident on the northbound Van Wyck. He was charged with grand larceny auto and possession of stolen property, police said. City transit officials, well-acquainted with McCollum’s obsession, said its employees had been “on the lookout for this career transit worker wannabe,” said NYC Transit spokesman Paul Fleuranges. “We applaud the NYPD’s recent arrest, and hope he is punished to the fullest extent of the law and kept far away from anything with wheels,” Fleuranges said. It is a shame that Darius continues to do these things. As I stated 2 years ago, jail is the answer for him. He clearly needs help that for whatever reason he has not received. Whatever help he has received clearly failed him & needs to be reevaluated. I also noted that it is a shame that he can’t get a job with the MTA. I know that they would never hire him with his past history. However he seems to clearly love transportation & has a lot of knowledge about the system. Maybe just maybe they could find a position that could keep him off the streets & from run-ins with the law.